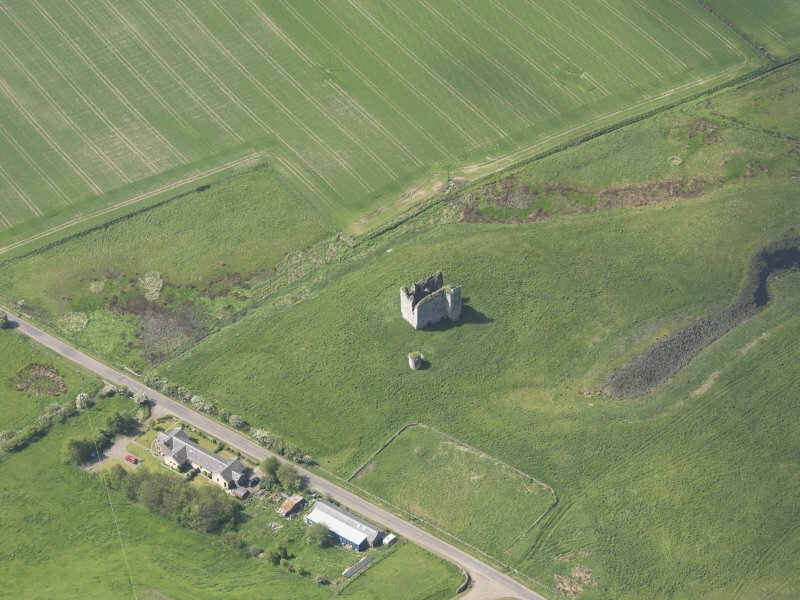 Oblique aerial view of Lordscairnie Castle, taken from the SSW. 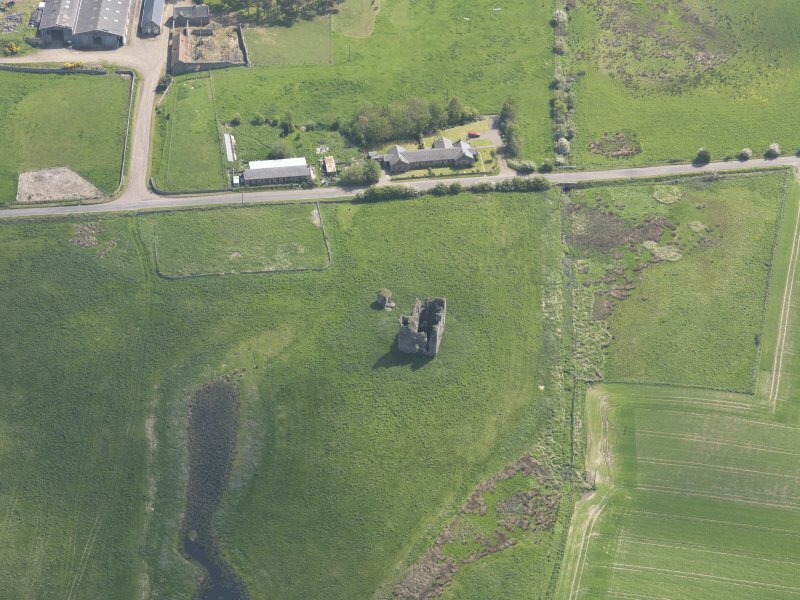 Oblique aerial view of Lordscairnie Castle, taken from the W.
Oblique aerial view of Lordscairnie Castle, taken from the ENE. 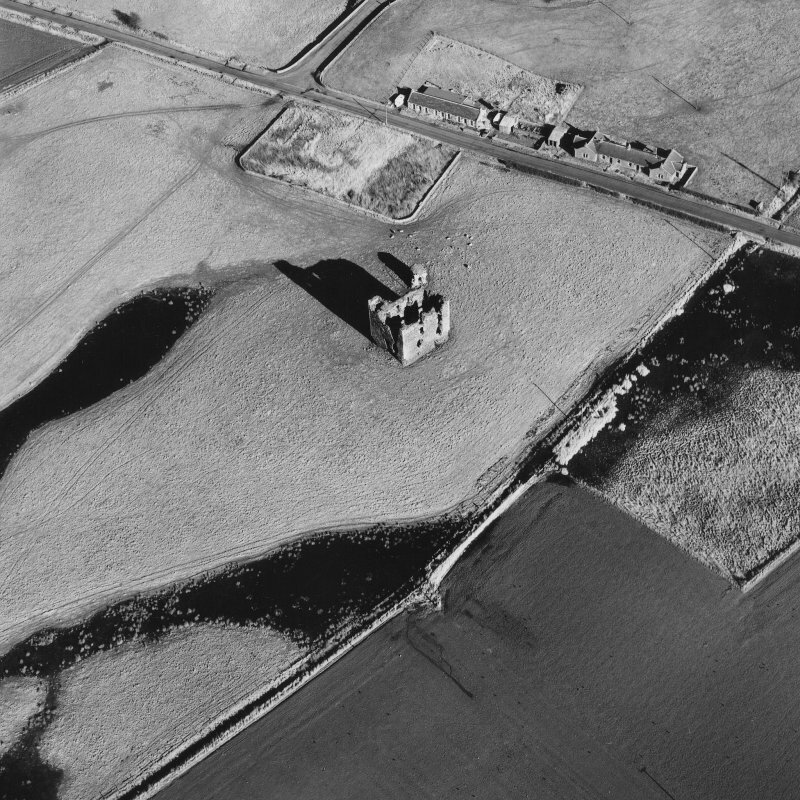 Oblique aerial view of Lordscairnie Castle, taken from the SW.
Oblique aerial view of Lordscairnie Castle, taken from the SE. 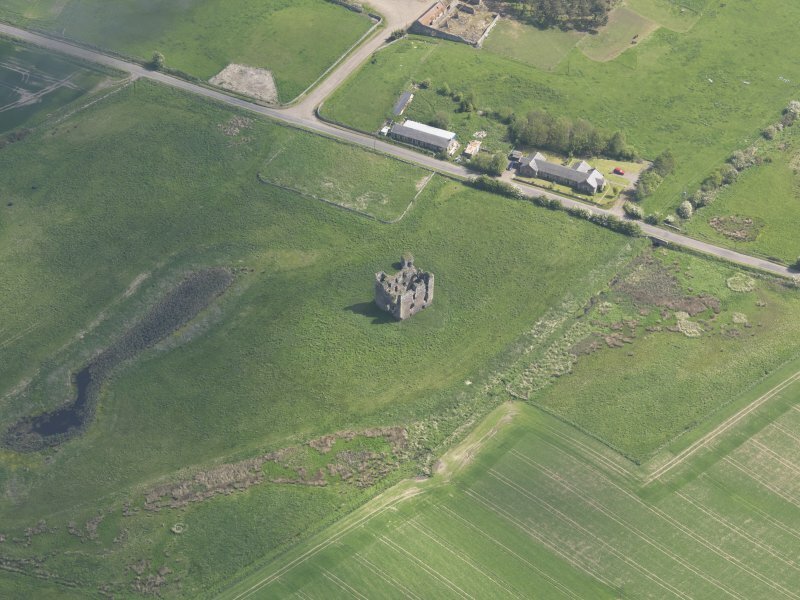 Oblique aerial view of Lordscairnie Castle, taken from the NW. 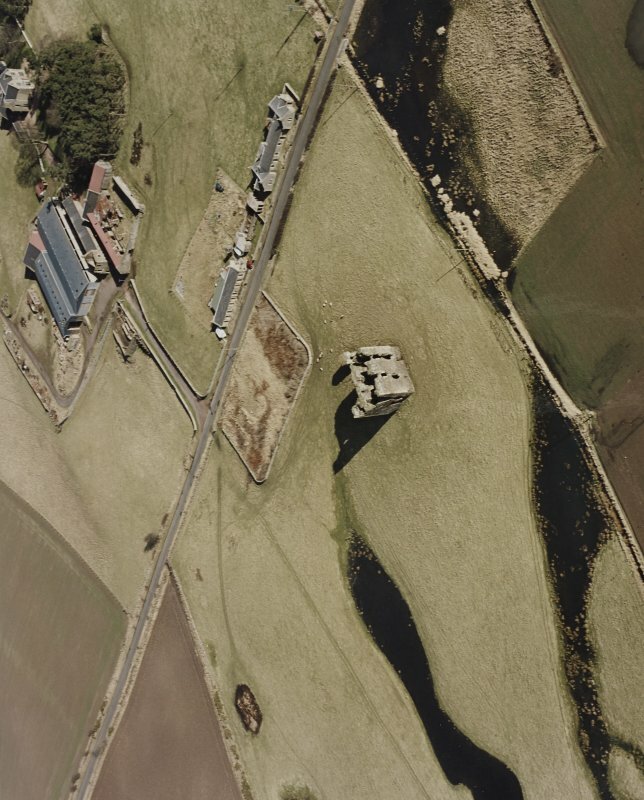 Oblique aerial view of Lordscairnie Castle, taken from the E.
Oblique aerial view of Lordscairnie Castle, taken from the S.
Lordscairnie Castle was a late 15th - early 16th century tower house, standing within a barmkin on a slight eminence; and Miller states that at one time it was surrounded by a wide moat which is still visible as a depression. 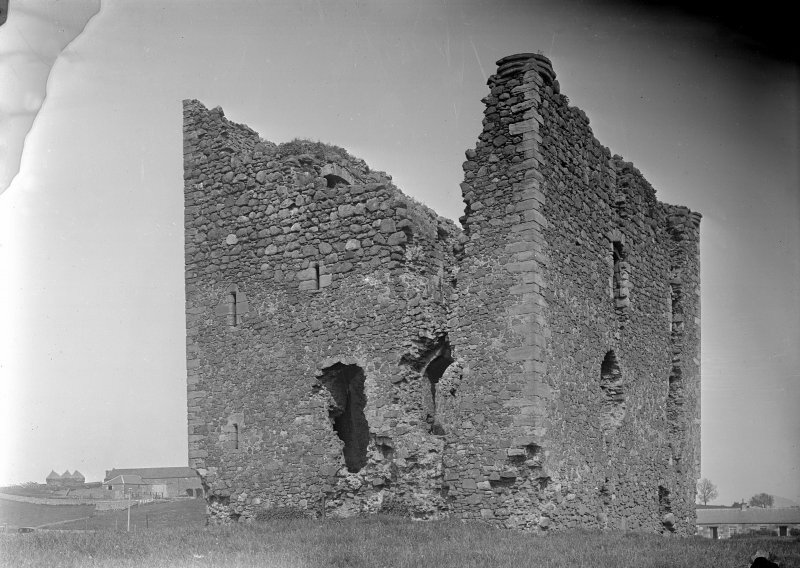 The tower is L-shaped on plan, and now very dilapidated. 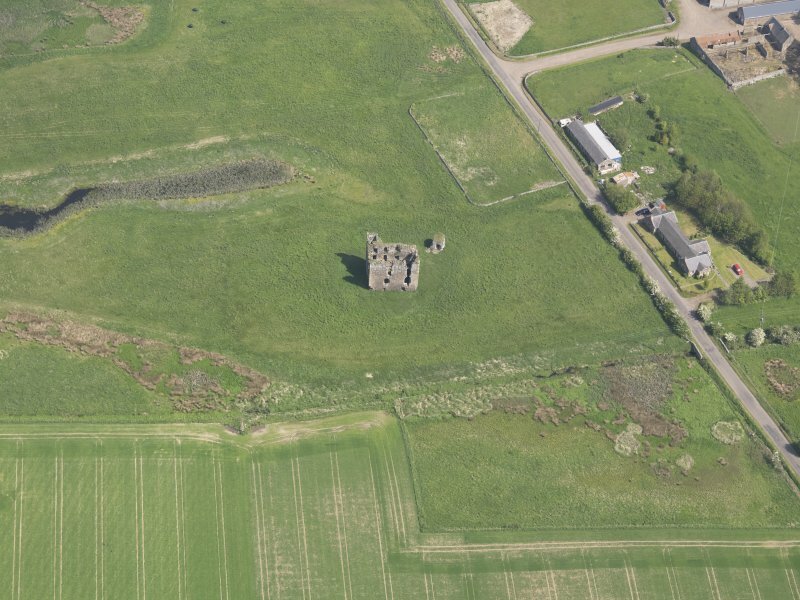 The enclosure containing the castle has been entered from the NE, where there are the remains of a circular tower, probably one of two set on either side of the gate. It is usually said to have been built by "Earl Beardie", fourth Earl of Crawford, in the first half or middle of the 15th century, but this seems too early. 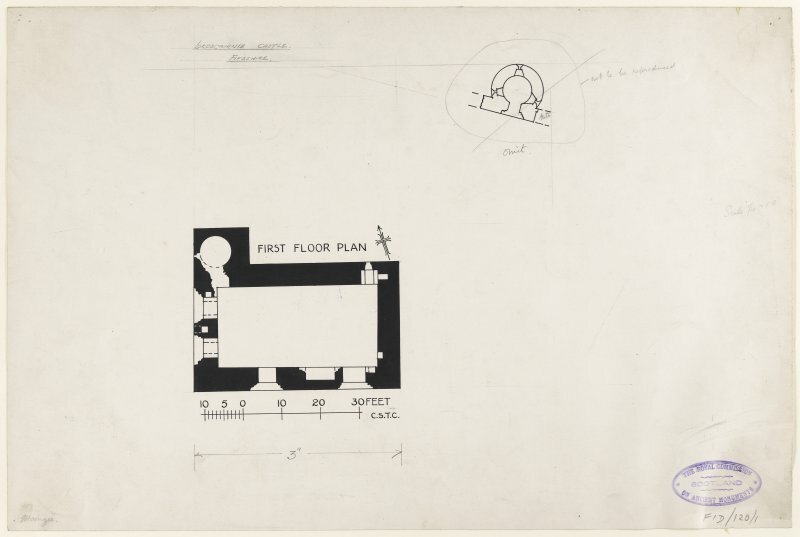 D MacGibbon and T Ross 1887-92; A H Millar 1895; RCAHMS 1933, visited 1925. 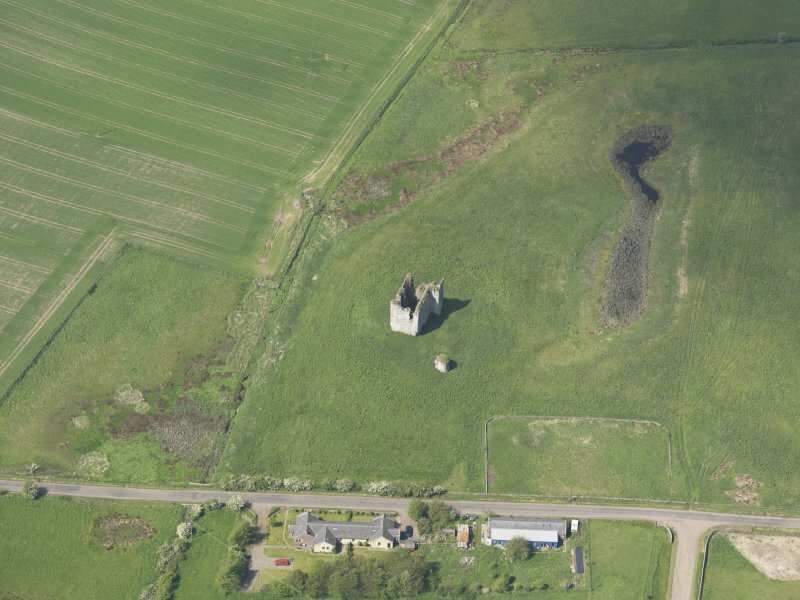 Lordscairnie Castle is as described above. 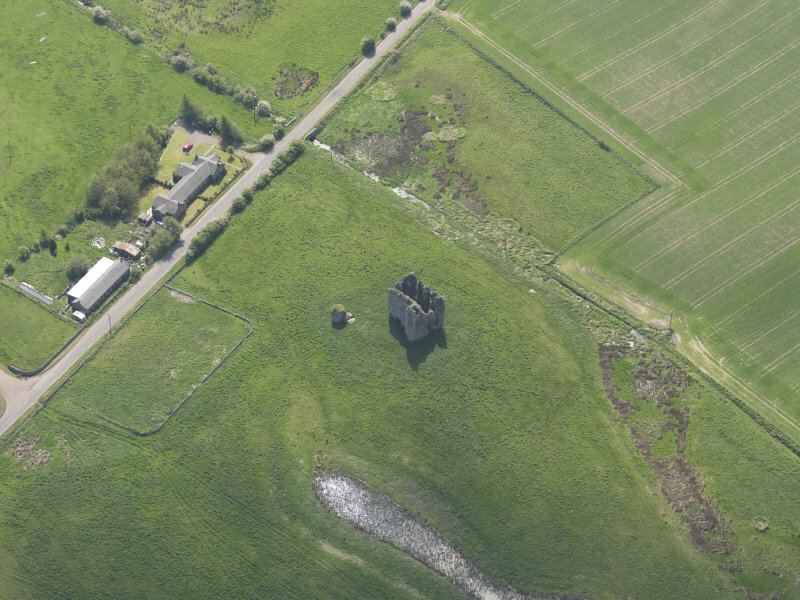 The main block measures 12.0m x 8.0m, and the wing 4.0m x 3.0m The tower, the sole remains of the barmkin, measures about 5.0m in external diameter and 6.0m high: there are no traces of a moat. Visited by OS (D S) 1 November 1956. 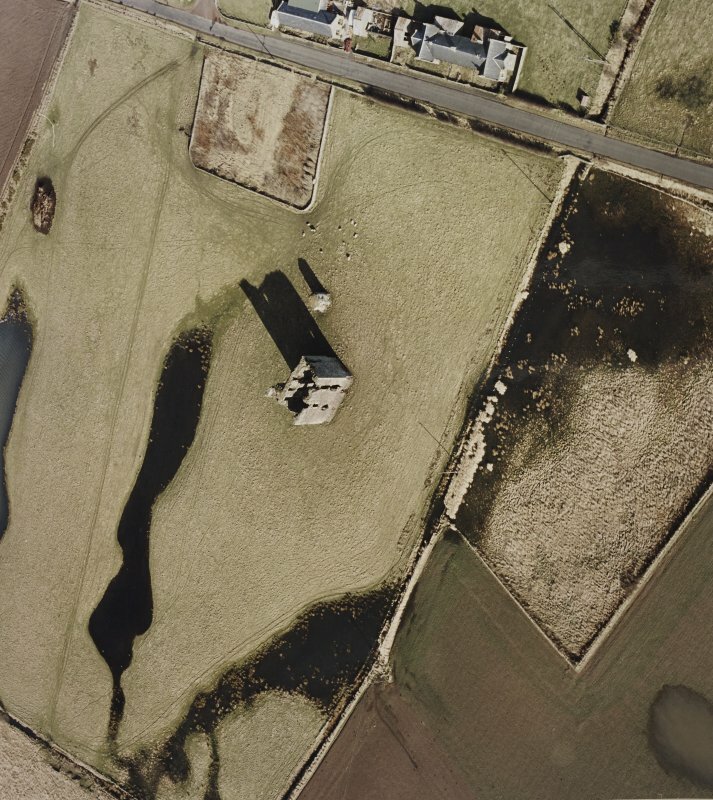 The remains of the circular tower, visible on oblique aerial photographs (RCAHMSAP 1995), is at NO 3483 1784. NO 348 178 As part of the programme of survey, excavation and analysis in advance of the proposed restoration of Lordscairnie Castle (NMRS NO31NW 12), a series of trial trenches were excavated over the site. 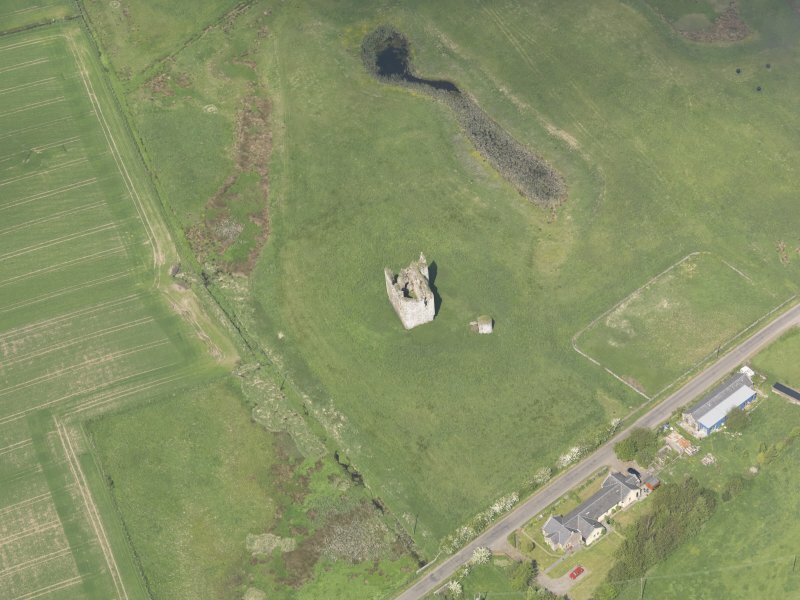 The trenches were located on two low ridges, outside the ruined remains of the tower, in order to examine certain key geophysical anomalies, as well as to investigate some evident topographic features. Period 1: prehistoric settlement. Ephemeral traces of extensive possible prehistoric settlement on both N and S ridges were discovered, although the precise date and character of that settlement still remains unclear. It seems likely that the natural rocky enclosure on the E end of the N ridge was the focus for some form of structural complex. This involved the terracing of the ridge, its sides as well as its summit, in order to receive buildings of slot and post construction. The scale of settlement and landscaping both in the medieval period and in the later 19th century, coupled with the effects of modern cultivation, has truncated much of this early evidence. The few finds suggest a settlement possibly pre-dating the Iron Age, but until more extensive excavation is completed the details of this period of occupation will remain largely conjectural. Period 2: early medieval settlement. 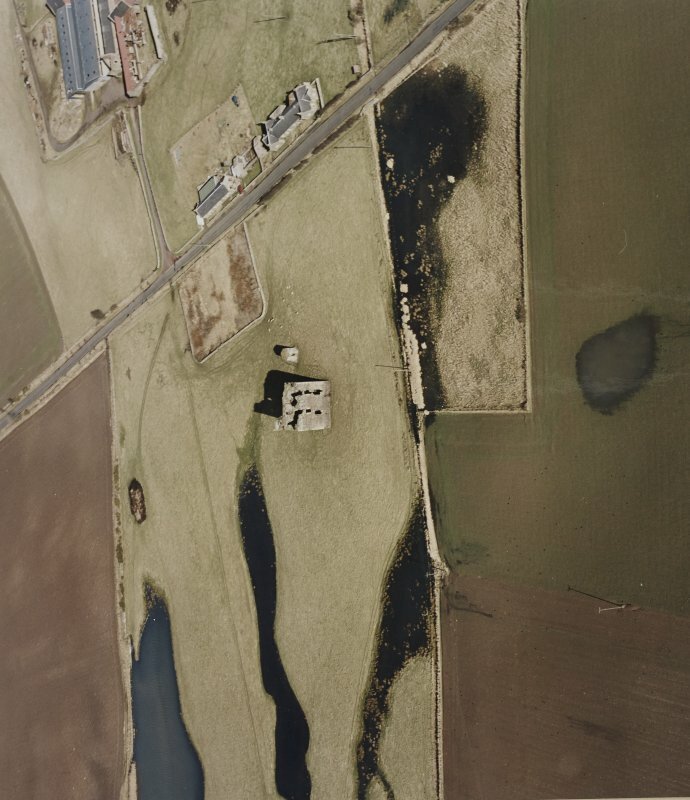 The known history of the site, in terms of the lands upon which the tower house was ultimately built, its occupation and demise, are reflected by the findings from the S ridge. 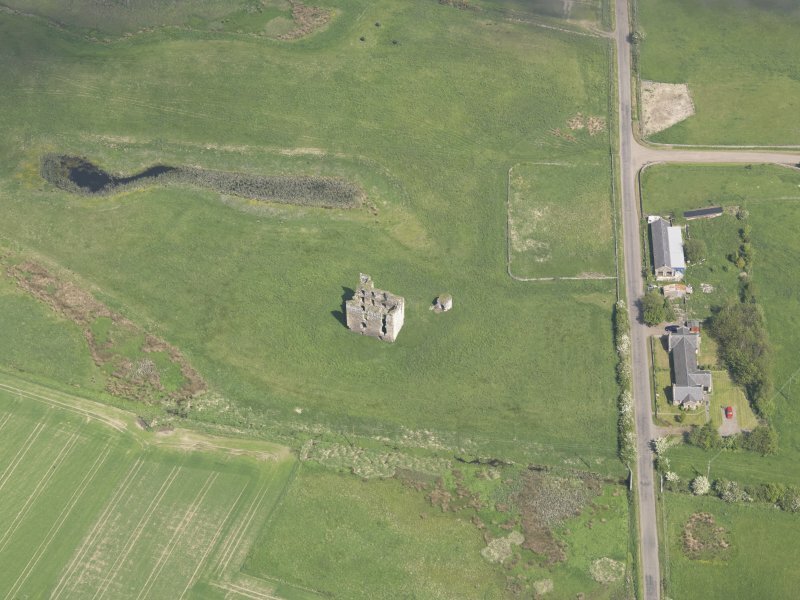 Documentary evidence implying an early medieval presence, from the mid-12th century up until the development of the site by the Lindsays, was confirmed by an array of residual structural features. These features essentially reflect a defended enclosure with timber buildings within at least two phases of dry ditch. 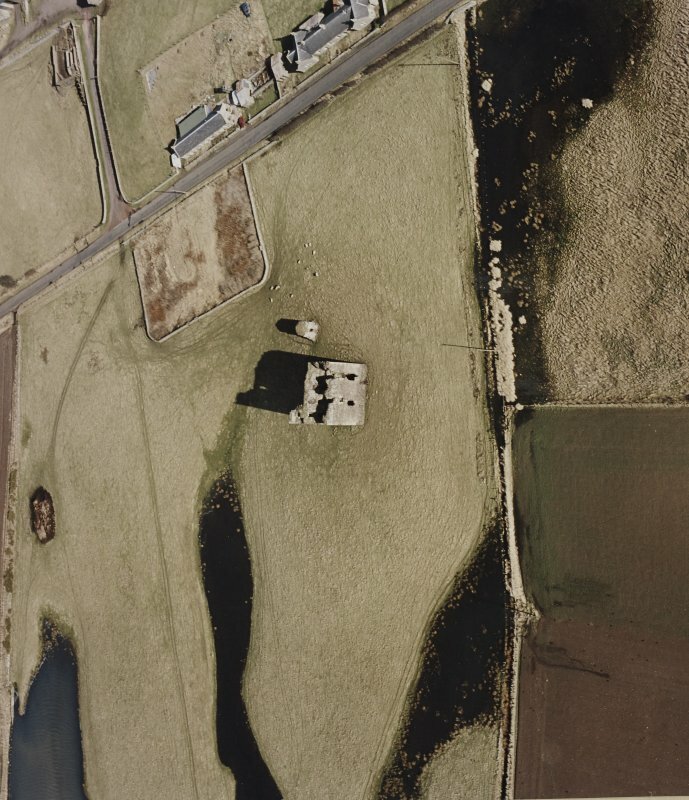 The earlier smaller version was backfilled when the second, wider ditch was established. The latter was probably augmented by a bank or terrace on the upslope side, which in turn may have received a timber palisade. Finds of white gritty ware pottery sherds suggest occupation of the site significantly earlier than the tower house construction. 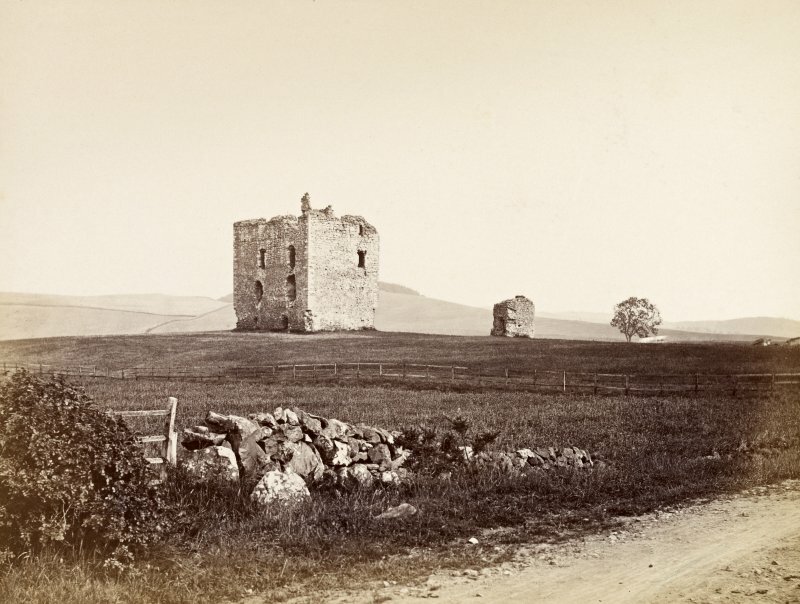 Period 3: tower house, mid-15th to mid-17th century. The Period 3 presence on the site was largely limited to evidence of the extent of pre-construction landscaping where residual Period 1 and 2 features were levelled or backfilled, as most of the structural elements were themselves drastically robbed out in Periods 6 and 7. Sherds of Scottish reduced ware pottery, as well as glazed redwares, all refer to the Lindsay occupation of the site. Later activity. 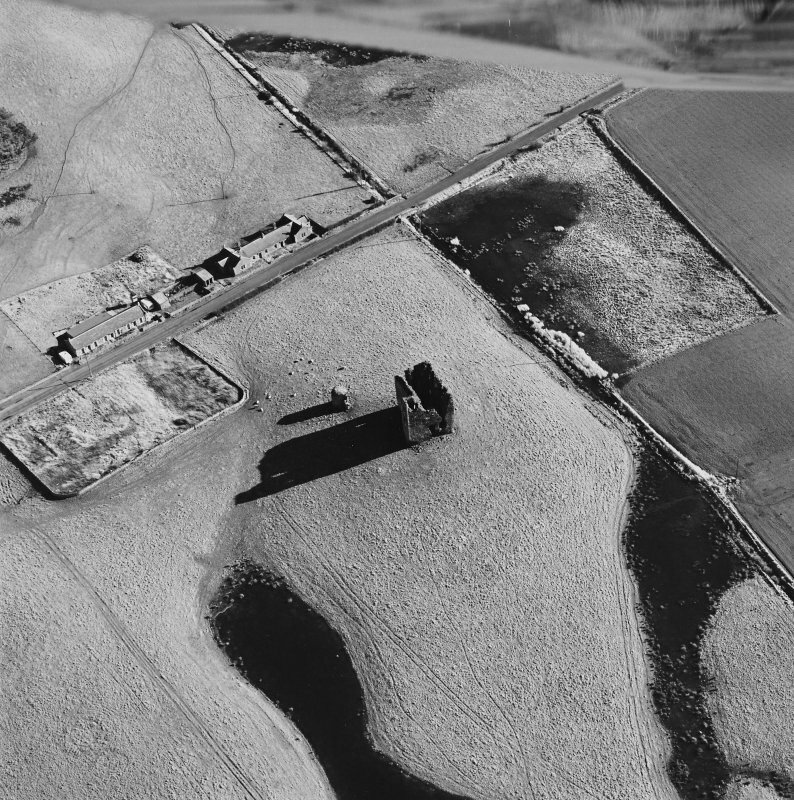 Possibly the most striking discovery of the archaeological assessment was the extent of post-medieval robbing and the effects on the surviving archaeology of turning the fields over to pasturage and cultivation. Virtually nothing survived of the barmkin enclosure wall and all obvious traces of even the barmkin surface itself were eroded away. 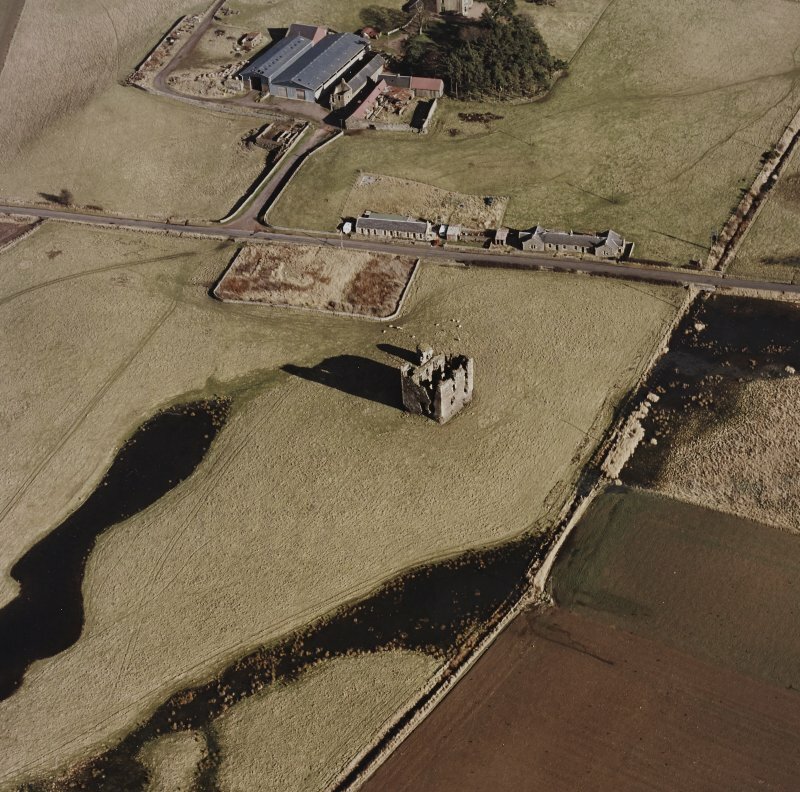 The scale of robbing clearly reflects the recycling of masonry for new farm and wall building, while the survival of the main edifice of the tower and the mural tower suggests a new role in the context of an improved agricultural landscape. The archaeological potential of the site is one of a truncated but complex sequence, best preserved on the sloping sides of the two ridges, which saw most settlement. In turn, the S ridge contains evidence of all periods of activity noted during the programme of survey and research, while the N ridge does not appear to have been extensively occupied after Period 1.